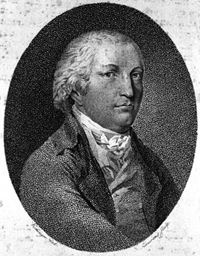 Figure 2.1 – Georg Joseph Beer (1763–1821), the Viennese eye doctor and professor who is considered to be the founder of the ophthalmology profession, was adamant that the environment and intense pressures of compulsory education were a “hot-house” for the onset of myopia in children. Also in 1813, London eye surgeon James Ware presented a paper to the Royal Society in which he stated, “Near sightedness usually comes on between the ages of ten and eighteen.” He further noted that the problem seemed to manifest itself in the literate and educated elite. What was likely the first statistical record of myopia, Ware reported that at least thirty two out of one hundred and twenty seven students at one college in Oxford were myopic. The count was based solely on students using either spectacles or a hand glass (for one eye), not eye examinations, so there may have been more cases of myopia. In any event, a correlation between nearsightedness and the demands of education was thus postulated. The same 2015 article further reported that up to 90% of Chinese teenagers and young adults are myopic. 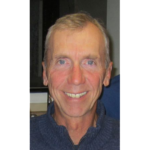 Although this is certainly an alarming rate — indicative of an “epidemic” as one researcher stated — the upward trend comes as no surprise when you study vision science archives. In 1885, Burton Randall, an ophthalmic and aural surgeon based in Philadelphia, undertook a meta-analysis of the nineteenth century myopia research. The data included eye examinations from almost 150,000 students at various ages and levels of education. The results, published in the American Journal of the Medical Sciences, showed that Germany had a high incidence of myopia, with a rate as high as 77% for seven hundred and thirteen theology students at the University of Tübingen. A few years earlier, Cohn had prepared a graph which included rates in the 80% to 88% range for senior level students at a couple of German schools (refer to Figure 2.2). 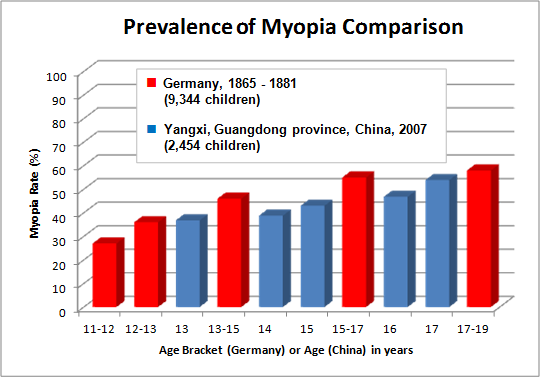 For a comparison of the average myopia prevalence in nineteenth century Germany at various school-age brackets versus that determined recently in a high myopia region of China, see the graph in Figure 2.3. 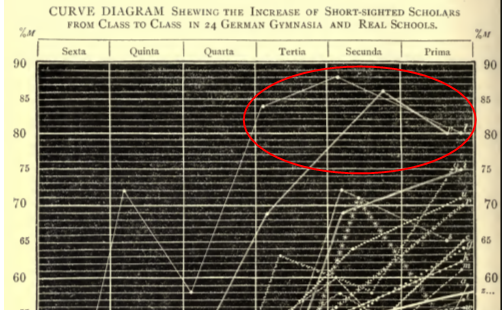 Figure 2.2 – Graph data from 1883 showing myopia rates as high as 80% to 88% for senior level teenage students at a couple of German schools. 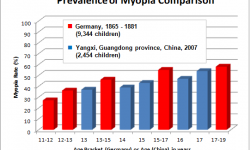 Figure 2.3 – Comparison of average myopia rates in nineteenth century Germany versus myopia rates in a region of China, 2007. The latest supposed cutting-edge finding from vision science research is that students should spend more time outdoors in natural sunlight. Scientists aren’t sure of the exact reason why this is beneficial, but studies have shown that it helps reduce the risk of children developing myopia. Once again, when we scroll back in time, we find this very recommendation as a preventative measure. At the aforementioned 1890 medical association meeting in Kentucky, eye doctor Francis Dowling presented his paper entitled, “The Prevention of Myopia.” One of his recommendations was as follows: “Young persons, who may be predisposed to myopia, should never study at night time, all near work with the eyes should be done by good clear sunlight.” For children already suffering from high degrees of myopia he had another more radical recommendation that would be considered laughable today: “In cases where the myopia is at all marked, all work with the eyes, such as study, etc., should be postponed until the sixteenth year. The child should, if possible, be sent to live in the country, where the range of vision is longer than in the city, and then it should be kept outdoors, in the fresh air, as much as possible.” Bear in mind that, for most eye doctors of that era, healthy eyesight of children came first and foremost. If that meant sacrificing time spent in compulsory education, so be it. Figure 2.4 – Side view of prescription lenses. (a) Concave (minus or negative) lens, used for myopia treatment, is thicker at the periphery and thinner (-) in the centre. 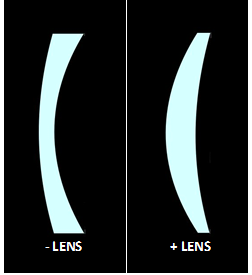 (b) Convex (plus or positive) lens, also called a magnifier that’s used in reading glasses, is thicker (+) in the middle and thinner at the periphery. There is one particular idea in the nineteenth century that current vision scientists completely ignore, yet it is one they seriously need to revisit and study. That idea, which was widely held and debated among eye doctors, is that prescription eyeglasses are injurious to the eyes of children, causing further progression of myopia. In subsequent years, the negative effect of concave lenses (see Figure 2.4) in glasses was eventually coined optical poison. Elie Dolgin, “The Myopia Boom,” Nature 519 (19 March 2015): 277. G. J. Beer, Das Auge, Wien 1813, quoted in Hermann Cohn, The Hygiene of The Eye In Schools, trans. and ed. W. P.Turnbull (London: Simpkin, Marshall and Co., 1886), 215. James Ware, “Observations Relative to The Near and Distant Sight of Different Persons,” Phil. Trans. R. Soc. Lond. 103 (1 January 1813): 31. Cohn, The Hygiene of The Eye In Schools, 215. Burton Randall, “The Refraction of The Human Eye: A Critical Study of The Statistics Obtained by Examinations of The Refraction, Especially Among School Children,” extracted from the American Journal of the Medical Sciences (July 1885): 23. Germany data in graph from Cohn, 69. China data in graph from Chen-Wei Pan, Dharani Ramamurthy and Seang-Mei Saw, “Worldwide Prevalence and Risk Factors for Myopia,” Ophthalmic Physiol Opt 32 (2012): 8. C.H. Hughes, comments to Francis Dowling, “The Prevention of Myopia: Read at the Sixteenth Annual Meeting of the Mississippi Valley Medical Association at Louisville, Ky., Oct. 9, 1890,”, JAMA 16, no.2 (10 January 1891): 45. C.W. McIntyre, comments to Francis Dowling, 46. Francis Dowling, “The Prevention of Myopia,” 44.